This year, countries from the grouping have contributed $9.3 million to UN and other aid organisations as humanitarian assistance. In a statement in Beirut this week, the US Assistant Secretary of for Population, Refugees, and Migration, Anne C. Richard called on the BRICS to increase humanitarian aid in Syria. It is not often that the US calls on the grouping to support humanitarian work in Syria. The speech also has an underlying assumption: BRICS has emerged one of the most powerful organisations in the world scene which cannot be ignored. 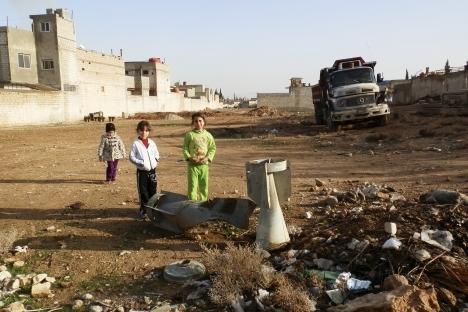 The Syrian crisis over the past two years has emerged as one of the worst humanitarian disasters. The recent United Nations estimate puts the death toll at 93,000. About four million people are displaced internally, while about 1.7 million people are displaced as refugees in Lebanon, Jordan and other neighbouring countries. The BRICS countries this year have contributed $9.3 million to UN and other aid organizations as humanitarian assistance. As the violent conflict still thrives, the catastrophe has assumed greater proportions with each passing day. The UN has developed an ambitious plan which would likely cost about $5 billion for the second half of this year for humanitarian purposes in the war ravaged country. Peace in Syria is not a casual requirement but an immediate imperative which cannot be stalled longer and made subject to politics among powers involved in the region. The recent G8 summit in Northern Ireland harped on a peaceful settlement of the conflict. The signs on the ground, however, are not that propitious as there is a feeling that the conflict will be further protracted with the supply of weapons and radical elements. The proposed peace conference, originally planned to be held in June, hangs in limbo as the stakeholders fail to evolve a consensus on the modalities of such a conference. BRICS collectively can play an effective mediator in Syria. Besides contributing to humanitarian assistance in a way suitable to its objectives, it can entice other powers including the US, UK and EU engaged in the crisis to develop consensus to address the crisis in a non-zero sum game framework. A first step in this regard will be putting the common people of Syria before any sectarian or a particular national or ideological goal in any solution framework. The Syrian crisis is getting murkier by each passing day. Supplying weapons whether to Assad or to his opponents is not going to address the real concerns. German Chancellor Angela Merkel told the German parliament recently that the risks of arming the militants in Syria “would be incalculable.” She further stated that “Germany will under no circumstances send weapons to Syria - a country in civil war - no matter how other countries deal with the arms embargo.” Perhaps the BRICS leaders will not disagree with Merkel particularly on this point that infusion of arms is not going to help resolve the conflict. The BRICS countries too have no fixation with a particular leader or faction, as emphasised by the group’s leaders on many occasions, in the conflict but with a peaceful resolution led by the Syrian people themselves. Russian President, Vladimir Putin stated in a recent interview, “We’re not advocates of the current Syrian government or the country’s current president, Bashar al-Assad.” It is time that BRICS must gear its diplomatic mechanism to checkmate humanitarian disaster and address conflict in Syria effectively. Dr. Debidatta Aurobinda Mahapatra is an Indian commentator. His areas of interests include conflict, terrorism, peace and development, Kashmir, South Asia, and strategic aspects of Eurasian politics.